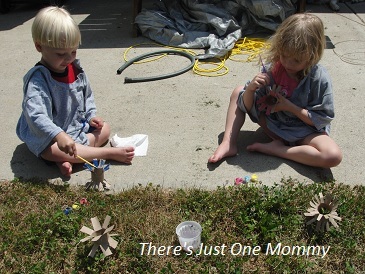 Looking for a fun spring or summer craft for the kids to do that’s inexpensive and fun to make? Recycled crafts are always fun and easy on the wallet. And when it comes to spring crafts, you just can’t beat flower crafts. 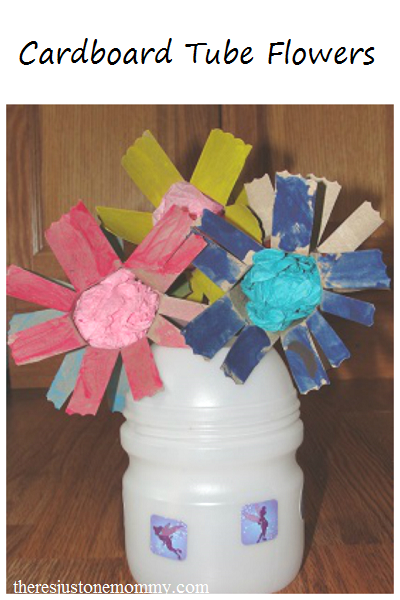 These cardboard tube flowers are bright and colorful and make a cute homemade gift that preschoolers can make. Affiliate links have been used below. For my full disclosure, click here. I have to give Family Fun magazine credit for the inspiration of this craft. The original craft showed flowers with much more narrow cut petals and green bamboo skewers as stems with slices of cardboard tubes as leaves. I changed the craft a bit to make it easier for younger children. To start, cut slits on each end of the cardboard tube, leaving about a 1 inch space in the middle un-cut. We cut 10 petals on each of our tubes, creating thicker petals that were easier for young children to paint later. Have your child paint both sides of the petals. If the weather permits, this is a great activity to do outside! Once the paint dries, you will add stems and flower centers. Bamboo skewers are great for this. I didn’t have bamboo skewers, so we recycled drinking straws for stems. Simply poke a hole in the center of the cardboard tube to push your straw into. Then crumple up some colored tissue paper and push it into the cardboard tube to make the flower’s center. Check your recycling container for the perfect vase. A recycled Kool-Aid container was just the right size for our 3 flowers. The kids decorated it carefully with fairy and flower stickers. When your children are finished you will have a unique table centerpiece that won’t wither in just a few days. 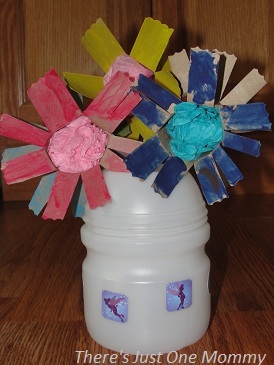 This cardboard tube flower craft would make a cute Mother’s Day gift or a fun teacher gift as well! I new there was a reason I keep saving the toilet paper rolls. Yeah another use for us. Following you. LOL – Oh, I’m sure my husband thinks I’m nuts sometimes when the t.p. rolls are laying all around the kitchen counter. But they are an easy and cheap craft item! My kids love when I tape two together and they use them as binoculars. Yes, we’ve done that too! So simple and yet entertains them for a long time. Again, you’ve come up with the cutest craft. I think children would be so pleased to have their creation as a centerpiece.